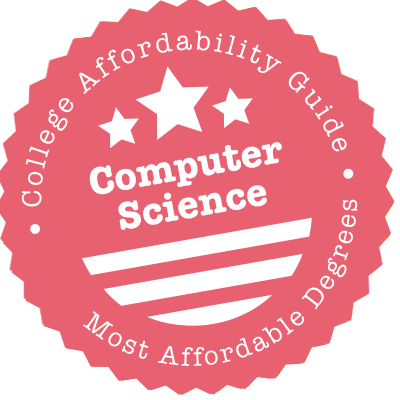 Scroll down to see the most affordable computer science degrees, as well as info on the different types of computer science degrees and computer science program accreditation. The Bachelor of Science in Computer Science degree at UC Irvine is offered through the Donald Bren School of Information and Computer Sciences (ICS). The program has eight areas of specialization: algorithms, architecture and embedded systems, bioinformatics, general computer science, information, intelligent systems, networked systems, systems and software, and visual computing. Students can pursue a second specialization by taking additional electives. Master of Science and Doctor of Philosophy degrees are available in computer science. The Master of Science in Information and Computer Science program has concentrations in informatics and in embedded systems. Academically qualified students can apply for the Robert Doedens Undergraduate Achievement Award ($500), while female graduate students can apply for the Microsoft Women's Research Award ($15,000, plus $2,000 travel allowance). The Department of Computer Science at University of Minnesota in Duluth offers two Bachelor of Science (BS) degrees - a BS in Computer Science and a BS in Computer Information Systems. The department also offers a Bachelor of Arts (BA) degree in Computer Science. Both BS and BA programs provide students with the fundamentals of computer organization and architecture, programming language, and data structures and related algorithms. UMD's Department of Computer Science also offers a Master of Science (MS) in Computer Science degree. This is a two-year program with a strong research component. The Department of Computer Science and Engineering at Texas A & M University offers Bachelor of Science (BS) degrees in Computer Science and in Computer Engineering. Students who plan to pursue graduate studies can participate in the Fast Track Program offered by the department. Under this program, students can complete both the BS and MS (Master of Science) degrees within five years. TAMU's Department of Computer Science and Engineering offers three types of graduate degrees - MS without thesis, MS with thesis, and Doctor in Philosophy (PhD). Computer science and computer engineering students can apply for a number of scholarships that have been established to support the department. Most scholarship awards are up to $1,500, but can vary from year to year. Rutgers University has programs leading to degrees in computer science at all levels from undergraduate to doctorate. Undergrads can earn a bachelor's degree in computer science from any of Rutgers's three campuses. At the Camden campus, students can apply for the Computer Science Research Academy to receive research grants and take advanced courses. The Camden campus is also home to a program in computer science: scientific computing, which has both a master's degree and a dual BS/MS program. At the New Brunswick campus, research groups cover topics such as artificial intelligence, robotics, and scientific computing. Rutgers's computer science program was named No. 105 among global university in 2018 by U.S. New magazine. UNC's Department of Computer Science gives students the chance to earn a Bachelor of Science (BS) or a Bachelor of Arts (BA) degree in computer science. There is also a BS/MS (Master of Science) combined program that allows students to graduate with two degrees in as few as five years. There are several research areas that computer science students can choose to specialize in, including bioinformatics and computational biology, computer architecture, geometric computing, robotics, security, and machine learning and data mining. Students can participate in study abroad opportunities, especially in two universities that the department works closely with - the National University of Singapore: School of Computing and the University College London. UIC maintains a BS in Mathematics and Computer Science. The program's majors compete against mathematicians and statisticians for half a dozen departmental scholarships, including the Herbert Alexander Award and the Bernard Kurtin Scholarships. As a rule, students enrolled in the PhD program in Mathematical Computer Science (or taking the concentration in the Master's in Mathematics) also qualify, while also being able to access department teaching assistantships and tuition waivers. The department also funds professional development activities to the tune of $500 for student presenters. Baruch College's Zicklin School of Business offers a BBA in Computer Information Systems, an MBA in Information Systems and an MS in Information Systems through its Department of Statistics and Computer Information Systems. The BBA in Computer Information Systems includes 12 credits of core coursework and has suggested tracks in business intelligence, financial IT, information assurance and IT auditing, security/networking, systems development, and apps, media and society. The MBA in Information Systems is a four course major that combines IT-oriented and IS strategy-oriented courses. The MS in Information Systems is a 30-credit program that provides more in-depth coverage of information systems than the MBA. Scholarships available to computer information systems students include the Donald P. Brennan Family Scholarship and the David M. Levine Scholarship. Students in the BA in Computer Science at Vassar College have several ways to reduce their degree costs. First, the Undergraduate Research Summer Institute (URSI) runs a 10-week paid internship for 50 students across disciplines; CS students make up about 20 percent of the total. Second, URSI leads to further opportunities for research collaborations between faculty and students. Third, National Science Foundation grants in recent years have funded student assistantships in the American National Corpus Project, which is focused on helping machines understand human languages, and Hexsim, which develops algorithms to assist robots with movement. Last, students are eligible for Center for Collaborative Approaches to Sciences awards, which help offset travel costs related to research presentations. UC Riverside's Computer and Science Engineering Department won 18 research grants in 2016 alone, including one from Los Alamos National Laboratory and 14 from the National Science Foundation. Undergrads pursuing Bachelor of Science degrees in Computer Science, Computer Engineering, or Computer Science with Business Applications can certainly pursue research opportunities. They should apply to the Payne Scholarship to partially fund their academic journey. For the MS/PhD in Computer science, research is all but guaranteed. In 2016, the department advertised PhD fellowships in 10 different areas, including artificial intelligence and cybersecurity. The deadline for consideration is in early January. The Jacobs School of Engineering at UC San Diego offers both Bachelor of Arts and Bachelor of Science degrees in computer science. There is also a BS in Computer Science program with a specialization in bioinformatics, as well as a BS in Computer Engineering degree. Jacobs School also offers a five-year BS/MS program for students with an excellent academic history. Students accepted to the MS program can choose from a wide range of concentration areas that include artificial intelligence, communication networks, cryptology and security, embedded systems and software, interaction design, and parallel and scientific computing. There is a Doctor of Philosophy (PhD) in Computer Science degree available. Computer science majors can apply for the Ken Bowles Scholarship for CSE (up to $1,500). The College of Science and Engineering at the University of Minnesota Twin Cities has a Bachelor of Science (BS) program in Computer Science. Students who wish to pursue a Bachelor of Arts (BA) in Computer Science can do so from the College of Liberal Arts. The Master of Science (MS) degree offered by the College of Science and Engineering has a thesis or non-thesis option. A Master's in Computer Science (MCS) is a course-work only option for students who are not interested in the research aspects of computer science. The college also offers a Doctor of Philosophy (PhD) in Computer Science. The Computer Science Department at Rutgers University offers Bachelor of Arts, Bachelor of Science, Master of Science and Doctor of Philosophy degrees in computer science. Undergraduate computer science majors can choose from six tracks of study: computing concepts and themes, computer and software systems, computer security, software engineering and information management, graphics and vision, and artificial intelligence and cognitive science. The B.S. program requires 68 to 71 credits of major coursework, while the B.A. requires 53 to 55 major credits. The M.S. in Computer Science is a 30-credit program offered in both a thesis and essay option. The Ph.D. program requires 48 credits of courses, an independent study and 24 credits of thesis research. The Department also offers a five-year honors B.S.-M.S. degree. Buffalo State offers a Bachelor of Science in Computer Information Systems, or CIS, that emphasizes applying current computer technology to real-world business problems. It differs from traditional computer science programs, which focus more on theory. CIS majors must complete 42 credits within the major. Required courses cover topics such as computer-based information processing, computer organization, systems analysis and design, database systems, and microcomputer applications. Electives within the major cover topics such as multimedia web programming, e-commerce, and information system security. CIS majors have the option of working an internship to gain real-world experience. The department also offers a minor in CIS, which requires students to earn 18 credits in departmental courses. Students interested in computer science can choose between a Bachelor of Arts or Bachelor of Science at SUNY Oswego. The B.A. in Computer Science is a more broad liberal arts program while the B.S. in Computer Science focuses more on application. Students seeking the B.A. must earn 47 major credits, including 21 core requirements, 11 math credits, and 15 credits in computer science electives. Students pursuing the B.S. must earn at least 72 major credits, including 21 core credits, 30 to 32 credits in math and natural science classes, and 21 credits in computer science electives. The department has state-of-the-art computer labs, and students engage in project-based learning and supervised research. Departmental scholarships include the Douglas Crane Memorial Scholarship ($1,000). Undergraduate students interested in computer science have two options at the University of California Berkeley. The Bachelor of Science in Electrical Engineering and Computer Sciences combines computer science with engineering, while a Bachelor of Arts in Computer Science covers theory, applications, and hardware and software design. Graduate students have the same engineering vs. computer science choice for a master's or Ph.D. program. Either way, they are entering one of the best computer science programs in the U.S., according to the 2018 U.S. News rankings, which put Berkeley's graduate computer degrees as No. 1 and the undergraduate programs at No. 2. Ph.D. candidates in computer science programs are provided with financial support at Berkeley. The Department of Computer Science at UC Davis offers Bachelor of Science degrees in computer science (CS) and in computer science and engineering (CSE). The CS program places an emphasis on software and offers courses in the fundamentals of computer languages, operating systems, and computer systems design. The CSE program focuses more on computer hardware as it applies to the analysis, design, and programming of digital computers and computing systems. There is an integrated BS/MS program available, which can reduce the required coursework for the MS degree by six units. After completing their bachelor degree, students can earn their MS in Computer Science with just one more year of study. A Doctor of Philosophy degree in computer science available as well. Westfield State supports bachelor's degrees in both Computer Science and Computer Information Systems. The latter comes with an optional concentration in end-user computing. Those looking for a scaled-down experience can get a smattering of both in the Computer and Information Science minor or a 12-hour shot in the certificate program. Those in the full program benefit from internships; the Student Technology Multimedia Center and the Center for Instructional Technology are partially staffed by Computer Science interns. The department's 150-something students run a Computer Science Club and a Gaming Club. There's also funding. The Pasquino-Lavoie Endowed Scholarship goes to full-time CS majors with a 3.0, while all students also receive free software through the Microsoft Developer Network Academic Alliance. Computer science majors at Barnard College can choose from three majors: computer science, information science, and a joint computer science-math major. Computer science offers students a variety of tracks. The foundations track prepares students for graduate work in fundamental, theoretical or mathematical aspects of computing. The systems track is appropriate for students who may seek a job in the computer industry directly after graduation or go on to graduate school. Other tracks include artificial intelligence, applications, and visions and graphics. The department has labs equipped for research in computer graphics, databases and digital libraries, data mining, wearable computing, robotics, and other areas. Under Barnard's partnership with Columbia University, the computer science program is part of Columbia University. Computer science majors at SUNY Oneonta can participate in seminars and independent study projects that allow them to take on more advanced subjects and work with faculty members in specialized research. The college hosts a Student Research and Creative Activity Day annually where students can present research. The Department of Mathematics, Computer Science, and Statistics has a club called the Sanford Society where students from all three programs can meet, network, and have fun. Computer majors also have a dedicated club, Computer Programmers United. Computer science students can apply for a job as a lab monitor or teaching assistant, which results in academic credit. Scholarships include the Ryder-Michalak Award, based on academic performance and other factors. The Computer Science Department at Appalachian State University offers computer science programs at the undergraduate and graduate level. The BS in Computer Science is accredited by the Computing Accreditation Commission of the Accreditation Board for Engineering and Technology and requires 65 credits of major coursework in subjects like computer systems, data structures, programming languages and software engineering. The MS in Computer Science is offered in a thesis or non-thesis track. The thesis track requires 30 semester hours of coursework, including a four- to six-credit thesis, and the non-thesis track requires 36 semester hours of coursework, including a three-credit project course. ASU's Computer Science Department offers several scholarships to its students, including the Computer Science Scholarship and the Edith A. Goodman Memorial Scholarship. Mitchell Technical Institute offers a one-year core program that leads to a diploma in information systems technology. Students who want further education can complete an internship and a second year of study to receive an Associate of Applied Science in Information Systems Technology. A second option for diploma holders is to take the online Office Technology Specialist program, which will result in an AAS in Computer Support Specialist. The information systems technology program is eligible for the Build Dakota Scholarship, a full-ride scholarship that covers tuition, fees, and books for specific two-year programs. Information systems technology students need a laptop computer, which they can buy, fully loaded with all software required for the program, from MTI. The College of Information and Computer Sciences at UMass Amherst offers both a Bachelor of Arts (BA) and a Bachelor of Science (BS) program in computer science. There is also a BS program in Informatics in Computer Science that is currently being offered on a limited basis. The Master of Science (MS) in Computer Science program allows students to choose from two tracks. The Professional MS track is for students who are not planning to continue to a Doctor of Philosophy (PhD) degree, while the Research MS track is for students who are planning to apply for a PhD program. Most students admitted to the program pursue an MS/PhD track, where an MS degree is acquired en route to a PhD. The Department of Information Technology and Computer Science at Saint Cloud State University offers a BS in Computer Science, a BS in Information Technology Security, an MS in Computer Science and an MS in Information Assurance. A BS in Computer Engineering is also offered in conjunction with the Electrical and Computer Engineering Department. The BS in Computer Science requires the completion of core computer science courses in subjects like operating systems, systems programming, computer architecture and software systems. Both the MS in Computer Science and the MS in Information Assurance are offered in two tracks of study: a thesis track and a starred paper track. The MS in Information Assurance can also be completed through a five year BS/MS program. The Department of Computer Science at Michigan Technological University offers Bachelor of Science degrees in computer science and software engineering, as well as graduate degrees in computer science, and computational science and engineering. The B.S. in Computer Science is available in five concentrations: general computer science, computer systems, applications, software engineering and education. The M.S. in Computer Science is available in three tracks of study: a project track, a thesis track and a coursework track. Students in all three tracks complete 30 credits, however those in the project track complete a three-credit project, those in the thesis track complete a six-credit thesis and those in the coursework track complete only traditional coursework. The Ph.D. in Computer Science requires the completion of a computer science M.S. program before admission. The Department of Computer Science is part of WSU's College of Engineering. The following computer science degrees are available: Bachelor of Science (BS), Master of Science (MS), and a Doctor of Philosophy (PhD). The department coordinates with the College of Liberal Arts and Sciences to give students the chance to pursue a Bachelor of Arts (BA) in Computer Science program. Through the same collaboration, students can also earn a BA in Information Systems Technology and a certificate in Scientific Computing. The Department of Computer Science works closely with the School of Medicine to enable graduate students to complete their PhD in Computer Science with a concentration in Bio-informatics and Computational Biology. Farmingdale State College's Computer Systems Department offers a Bachelor of Science in Computer Programming and Information Systems in four tracks of study: programming, systems development, networking and web development. The BS requires 48 credits of core business and technology coursework in subjects like programming, data communications, systems analysis, and design and accounting. Additionally, Farmingdale's Department of Electrical and Computer Technology offers a Bachelor of Science in Computer Engineering Technology that requires 65 credits of technical courses in subjects like computer programming, computer applications, digital design, microprocessors and advanced networking. The School of Business, in which the Computer Systems Department is housed, offers one scholarship to computer systems students: the APICS NYC/LI ERP Scholarship. The Bachelor of Science in Computer Science program at CSU Long Beach is accredited by the Computing Accreditation Commission of ABET (Accreditation Board for Engineering and Technology). Upper division coursework covers topics such as database fundamentals, computer architecture and organization, data structures and algorithms, and software engineering. Computer science is also offered as a minor program of study; a minor in computer science applications is available as well. The Master of Science in Computer Science program has options in computer engineering and computer science. As part of the College of Engineering, computer science majors can apply for more than 100 scholarship opportunities with amounts ranging from $500 to $2,500, such as the Dr. Sheila Foster Award and the Northrop Grumman Scholarship. Lake Area Technical Institute offers a degree in computer information systems, which will prepare students for careers in the IT field. Students often go on to become web developers, programmers, networkers, security specialists, and database administrators. They offer four different specialist options: the programming specialist option, the network specialist option, the visual communications specialist option, and security specialist option. Many of these courses can be taken online. Class sizes are small, and LAT students get more individualized attention and instruction. Students will have the opportunity to gain real world experience by participating in internships, and a good portion of the coursework involves practical application of the material to help graduates to get a job soon after completing the program. Iowa State University's Department of Computer Science offers a BS in Computer Science, a concurrent BS/MS in Computer Science, a BS in Software Engineering, an MS in Computer Science and a PhD in Computer Science. The BS in Computer Science requires a minimum of 44 credits in computer science, including courses in data structures, digital logic, software development, programming languages and operating systems. The MS in Computer Science requires at least 31 credits, including six credits for a thesis or creative component that results in a formal paper. The PhD in Computer Science is a research-focused degree that requires 72 major credits (up to 36 credits from a master's degree), including 36 research credits and attendance of a research colloquia. UF's Department of Computer & Information Science & Engineering (CISE) has a computer science program with a strong engineering oriented basis (BS in Computer Science - College of Engineering). Another bachelor's program (BS in Computer Science - College of Liberal Arts and Sciences) lets students adhere to a liberal arts curriculum while studying computer science. The BS in Computer Engineering offered by CISE is administered with the Department of Electrical and Computer Engineering. This program is accredited by the Engineering Accreditation Commission of ABET (Accreditation Board for Engineering and Technology). CISE offers the following Master of Science/Engineering degrees: M.S. in Computer Science, M.S. in Computer Engineering, M.E. in Computer Engineering, M.S. in Computer Digital Arts and Sciences, and M.S. in Computer Science. Berea College offers a Bachelor of Arts in Computer Science with three concentrations: a general concentration, a computer science concentration and a computational mathematics concentration. Students in all three concentrations are required to complete core courses in software design and data structures, as well as a capstone course or experience. The capstone experience for students in the general concentration can be completed in the form of a senior project, internship or undergraduate research. Students in the other concentrations can fulfill the capstone requirement through a senior project or undergraduate research, or possibly an approved course (for computational mathematics students). Computer science students also have the opportunity to participate in the Math and Computer Science Club. Binghamton University offers several undergraduate and graduate degree options through its Department of Computer Science. Degree options include a BS in Computer Science, a dual bachelor's degree program in computer science and systems engineering, an accelerated five year BS/MS program in computer science, a fast-track BS in Computer Science/MBA program, an MS in Computer Science and a PhD in Computer Science. The undergraduate Computer Science program is accredited by the Accreditation Board for Engineering and Technology, and students can specialize in areas like software systems, networking, operating systems, web-based systems, graphics, robotics, microprocessor-based design and game design. BU's Watson School of Engineering offers several scholarships to computer science majors, including the AnnMarie Gaiso Goldfarb '93 Scholarship and the Generosity of Spirit Scholarship. The Department of Computer Science and Engineering at Michigan State University offers undergraduate programs in computer science and computer engineering, as well as MS and PhD programs in computer science. The undergraduate computer science program requires 33 credits of computer science core coursework in subjects like programming, computer organization and architecture, algorithms and data structures, and operating systems. The computer science MS and PhD programs offer advanced study and research in four general areas: software systems, intelligent systems, networking and ubiquitous systems and biological computing. Scholarships available to computer science students at MSU include the Christopher J. Jackson Endowed Scholarship in Computer Science and the Anil K. Jain Endowed Graduate Fellowship. Students interested in computer science have a choice of two bachelor degree programs and four minor programs at Queens College. A Master of Arts in Computer Science and an accelerated B.A./M.A. program is offered at the university, and members of the Queens College computer science faculty advise and conduct research with Ph.D. candidates through the CUNY Graduate Center. Undergrads can earn a Bachelor of Arts in Computer Science or pursue a Bachelor of Science, which requires them to take more computer science, math and experimental laboratory classes. Students minoring in computer science can choose a track in Computer Science, Computer Information Technology, Computational Linguistics, or Financial Modeling. The primary focus of the master's program is software. Undergraduate students can major in computer information technology through Brigham Young University-Idaho's Department of Computer Information Technology. The BS in Computer Information Technology requires 41 credits of CIT core courses, including courses in programming, database design and development, web front end development and networking. Additionally, the Department of Computer Science and Electrical Engineering offers Associate of Applied Science degrees in electrical and computer engineering and computer programming and Bachelor of Science degrees in computer science, computer engineering and software engineering. The BS in Computer Science provides students with foundational experience in algorithm development, procedural and object-oriented design and programming, software engineering practices, data structures and computer organization. The Department of Computer Science at City College of New York offers a Bachelor of Science in Computer Science, Master of Science in Computer Science, Master of Science in Information Systems, and Ph.D. in Computer Science. In conjunction with the Electrical Engineering Department, it also offers a Bachelor of Engineering in Computer Engineering. Curriculum is designed for students seeking careers in research, development, or business. Computer science faculty members are involved in many areas of research, including computer architecture, computer security, image analysis, pattern recognition, software engineering, and digital signal processing. Advanced undergraduates and graduate students have the opportunity to participate in faculty research. The computer science program is accredited by the Engineering Accreditation Commission of ABET. Hunter College awards a Bachelor of Arts in Computer Science and a B.A. in Computer Science with a concentration in bioinformatics. To earn the degree, students must complete at least 42 credits in computer science classes, with 31 of those credits from required classes. Additionally, the program requires 14 collateral credits in specific math classes. The Bioinformatics concentration has different requirements, including 27 credits in computer science, 12 credits in biology, 12 credits in chemistry, and 17 credits in math and statistics. Department faculty members have a number of specialties, including program verification, graph theory, computational linguistics and psycholinguistics, and computational biology and bioinformatics. Computer Science majors from underrepresented populations are eligible for the Catalyst Scholarship ($6,475 annually). Texas Woman's University offers a Bachelor of Arts in Computer Science as well as a Bachelor of Science in Computer Science. The computer science program prepares students for successful careers in computer science in industry, government, or further graduate studies. Students may be eligible for the Rose Marie Smith Endowed Scholarship for Student Teachers in Mathematics and/or Computer Science, the Dr. Ben Goldbeck Endowed Scholarship, as well as other scholarships. Students may be involved with the student organizations Kappa Mu Epsilon (KME) or the Association of Computing Machinery (ACM). SUNY Polytechnic Institute offers a Master of Science in Computer and Information Science that allows students to specialize in Software Engineering, Systems and Architectures, Algorithms and Theory, or Artificial Intelligence and Modeling. To receive the degree, candidates must complete 33 credits, including either a thesis or project. Undergraduates can pursue a Bachelor of Science in Computer and Information Science that allows them to concentrate in areas such as Information Assurance/Data Security; Entertainment Computing, System Administration; Scientific and Engineering Computing, Network and Grid Programming, System Modeling and Simulation, or Information Technology. The program requires students to take seven core computing classes, three computer science electives and to complete a capstone project. The university also offers a B.S. in Computer Information Systems. The Department of Computer and Information Science at Brooklyn College is one of the largest in the New York City area, with more than 30 full-time professors. On-campus computer labs are equipped with more than 1,000 computers for student use. Undergrads can earn a Bachelor of Science in Computer Science, Information Systems, Multimedia Computing, or an interdepartmental bachelor's degree in computational mathematics, offered jointly by the math and computer science departments. Education students can pursue a concentration in computer and information science. Graduate students can earn a Master of Arts in Computer Science or a Master of Science in Health Informatics or in Information Systems. Scholarships available for CIS students include the Softech Resources Inc. Scholarship (amount varies). The Department of Computer Science at SUNY Plattsburgh offers Bachelor of Science (BS) and Bachelor of Arts (BA) degrees in three areas - Computer Science, Computer Security, and Information Technology. The computer science program includes the study of algorithms and programming languages, as well as the physical components of electronic technology. Students gain skills and knowledge that prepare them for careers as computer science professionals or for continued education in the field. The department coordinates an internship program that provides valuable work experience for students prior to graduation and provides them with future employment connections. The University of North Texas offers a Bachelor of Science in Computer Science that is fully accredited by the Accreditation Board for Engineering and Technology. Students who graduate from this program will go on to pursue graduate studies in a computer science related discipline and/or a career that utilizes computer science. By the time students graduate, they will have the ability to analyze problems and identify appropriate computing solutions, the ability to communicate efficiently with different audiences, and an ability to use current tools, techniques, and skills that are necessary for computing practice. Students may join organizations such as the IEEE Computer Society and the Student Chapter of the Association for Computing Machinery. The Bachelor of Science in Computer Science program at Cal Poly Pomona has been accredited by the Computing Accreditation Commission of ABET (Accreditation Board for Engineering and Technology) since 1994. The curriculum includes courses in data structures and algorithms, computer architecture, discrete structures, operating systems, software engineering, and computer organization and assembly programming. There is also a Master of Science in Computer Science program available. The university received a five-year grant from the National Science Foundation CyberCorps Scholarships for Service program to fund the training of qualified students who are interested in careers in cyber security. A full tuition and fee waiver is awarded, in addition to a $22,500 stipend for undergraduate students and a $34,000 stipend for graduate students. Computer science (CS) graduates are some of the most sought-after professionals in the job market today. Qualified candidates are desperately needed to deliver solutions in programming, information security, web design and related pursuits. A versatile CS degree can lead to well-paid positions in a variety of fields including computer programming, information research, database administration and software development. To help you in your journey towards a fulfilling career, we’ve developed this short education guide. In it, you’ll find information on everything from degree options to career opportunities to tips on choosing a program. We explain the difference between regional and ABET accreditation and cover the raging debate between “degree vs. self-study”. An associate’s degree in computer science (CS) is a 2-year undergraduate program that provides students with the fundamentals of networking, programming and database management. This degree is often offered by community colleges and for-profit schools. Generally, you must have a GED or high school diploma to apply. Associate of Applied Science (AAS) in Computer Science: Coursework has a practical focus. A degree for students who wish to start work straight after graduation. Associate of Arts (AA) in Computer Science: Typically includes humanities courses. A standard choice for students interested in pursuing a BA degree. Associate of Science (AS) in Computer Science: Typically includes extra science courses. The standard choice for students interested in pursuing a BS degree. Associate of Technical Arts (ATA): Often offered in a wide variety of career areas. Most importantly, look for programs that drill you in technical, practical skills that will qualify you for jobs. Learn more about How to Recognize a Quality CS Degree. A bachelor’s degree in computer science (CS) is a 4-year undergraduate program that grounds students in the theory (e.g. mathematics, algorithms) and the practical applications of computers (e.g. engineering, monitoring, maintaining and protecting hardware, software and networks). Generally, you must have a GED or high school diploma to apply. The majority of these degrees will contain the same core courses in computer science. The difference will come in the focus (e.g. math vs. engineering vs. applied science) and general education courses (e.g. a BA will have more humanities courses than a BS). Most schools will allow you to choose electives in your 3rd and 4th years. This will give you the chance to specialize in your area of interest (e.g. cyber security, web development, cloud computing, machine learning/AI, robotics, etc.). Above all, look for programs that provide you with independent, hands-on technical experience and a firm grasp of theory. Learn more about How to Recognize a Quality CS Degree. A master’s degree in computer science (CS) is a 2-3 year graduate program that provides students with advanced skills in computing. In recent years, there has been a growing trend towards specialization and master’s programs have become highly focused. This degree is particularly popular with working professionals. You must have a baccalaureate in order to apply. MBA in Computer Science: A business-focused degree that looks at leadership, budgeting, marketing and related topics. A good choice for candidates interested in IT management. Master of Computer Science (MCS): A professional degree that may cover the same coursework as an MS, but does not include a research component. A potential choice for candidates who aren’t interested in a PhD. Master of Science (MS) in Computer Science: A technical and research-focused degree. A good choice for candidates interested in specializing in high demand technologies or considering a PhD. MS/MBA in Computer Science: A dual degree that combines coursework from the MBA and the MS in a condensed timeframe. Before you choose your degree, consider your long-term career goals. Do you want to be a CIO? Then an MBA in Computer Science might be best. Are you thinking of becoming a Security Architect? You could consider an MS with courses in advanced engineering and cyber security. Learn more about How to Recognize a Quality CS Degree. The standard degree at this level is the Doctor of Philosophy (PhD) in Computer Science. A strong PhD program will have professors who are currently involved in exciting projects, dedicated research centers and strong research funding numbers. Your choice of advisor can be just as, if not more important, than the program itself. A certificate in computer science (CS) is a non-degree qualification that focuses on specific computing skills. It generally takes around 6 months to 1 year to complete. Thanks to demand, online certificates have become increasingly popular. Undergraduate Certificates: Designed for high school or GED graduates. Often covers the fundamentals of CS (e.g. C++ and Java programming). Graduate Certificates: Designed for baccalaureate holders. Allows students to specialize in specific area of technology (e.g. game development, AI, advanced programming). We recommend that your college or university has regional accreditation. This is a “seal of approval” granted to institutions (e.g. non-profit and public colleges and universities) by one of six regional accrediting bodies (e.g. Middle States Association of Colleges and Schools). Regional accreditation only applies to the college or university. For the program itself, you can ask about ABET accreditation. The Accreditation Board for Engineering and Technology (ABET) accredits applied science, computing, engineering and technology programs. It’s not necessary for your degree to have ABET accreditation (there are many good programs without it), but it does show you that your school is taking its responsibilities seriously. ABET accredits associate’s, bachelor’s and master’s degree programs, but not doctoral programs. It uses the same criteria for on-campus, hybrid and online programs. There are some ABET-accredited 100% online programs. Do I Really Need a CS Degree? Not necessarily. The field of computer science field is littered with stories of drop-outs who have made billions. Mark Zuckerberg, Bill Gates, David Karp – these are folks who did just fine without a CS degree. Self-Study: Use boot camps, online courses (e.g. MOOCs), training manuals and work experience to teach yourself. CS Degree: Put your money down on a recognized educational qualification. Employers are focused on hard skills, not degree titles. Some companies love that self-educated candidates are smart, driven and up-to-date in the latest technologies. They’re thrilled that their new hires don’t need supervision, love what they’re doing and are creative enough to adapt to any challenge. What’s more, self-study is significantly cheaper and faster than 4 years of school. You’re responsible for creating your own education path and sticking to it. Unless you find a mentor, there is no one making sure that you’re doing things properly – and employers will be looking for error-free work. When you start applying for jobs, you’ll will be going up against candidates with degrees from respected schools. As you climb the career ladder, you may find it harder to advance to top management positions without an academic qualification. If you’re going down this route, make sure you have solid work experience, great references/mentors and multiple examples of real-world projects in your portfolio. Some employers and HR departments are reassured to know you have been schooled in important fundamentals. For example, Google generally expects candidates to have a CS degree from a top school. Companies also appreciate that a deep understanding of computing theory can make you a better programmer, engineer and fix-it person. With a degree, you will have the university behind you. Your school can help with career placement, networking and interviews with big companies looking for graduates. After graduation, you will often start at a higher salary than your non-degree peers and may find it easier to progress to management-level positions. A bad degree can be worse than no degree at all. Employers are constantly complaining that CS graduates have no practical skills and can’t even do basic things like code. If you don’t choose wisely, you may end up spending tens of thousands of dollars (and valuable time) on a qualification that is useless in the real world. Want to avoid this trap? Learn How to Recognize a Quality CS degree.